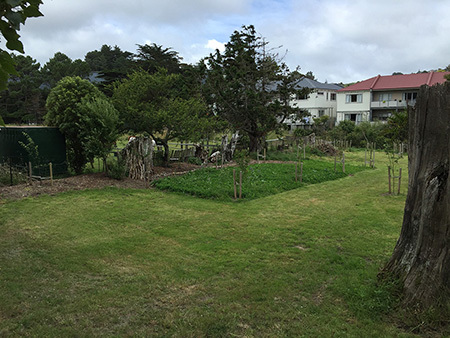 Scroll down to see the progress achieved by the Heritage Gardener's in 2017, with the support of the local community and Wellington City Council. This calendar year we volunteered 389 hours! 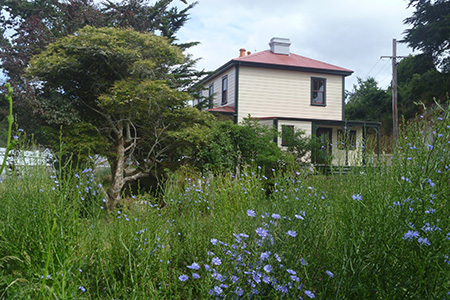 We planted ferns and ponga and natives grasses, developed a formal lawn and planted a hedge around it, planted a scented woodland garden, and a flower bank, and many trees that the colonial settlers would have brought out from 'the old country'. We weeded periwinkle and convovulous and killed blackberry. We mulched our gardens and set up a compost bin. 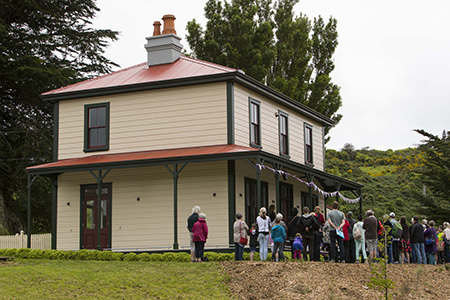 We visited the historic Gear homestead, contributed articles to the Heritage Today magazine, and studied historic garden catalogues from the Alexander Turnbull Library. 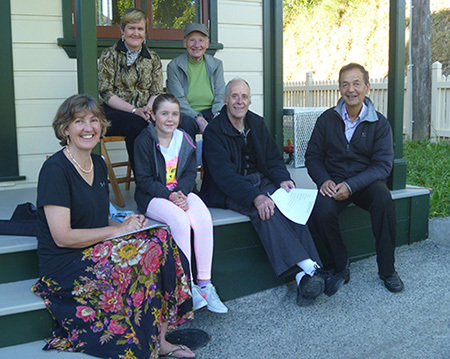 We also developed a Memorandum of Understanding with Wellington City Council. Our traps caught eight rats, a stoat and two mice. Here we are at our last meeting for the year. Front row from left: Claire, Anna, Paul and Sabah. Back row from left: Carolyn, Joan. Behind the camera, Lorna. Absent, Heather and Hazel. 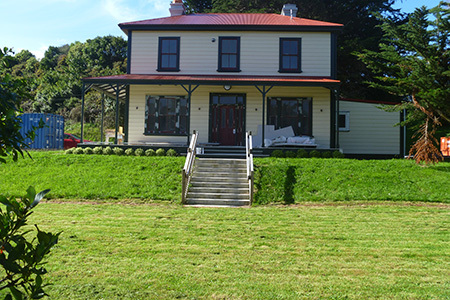 Official Opening of the Halfway House, Sunday, 29 October, 2017. 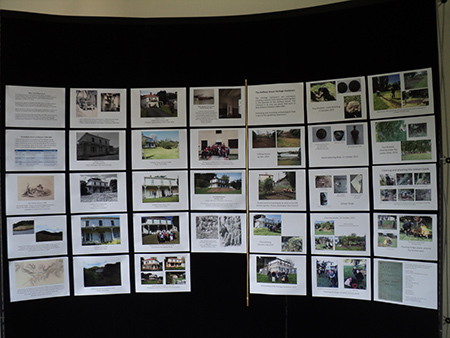 The Heritage Gardeners put a heritage display together, and had a plant stall, which raised $152. The funds will be used to purchase heritage roses for the 'flower bank'. 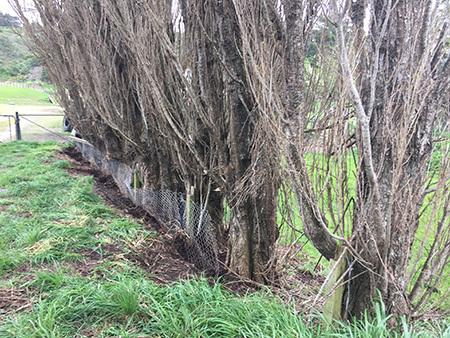 Unearthing the fence - before and after. Rain, rain, and more rain. 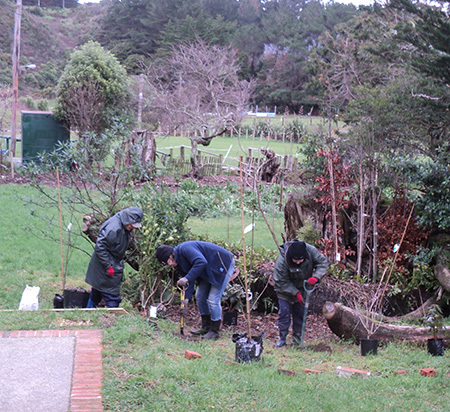 The Heritage Gardeners were digging and planting throughout an extremely wet winter. These images were taken on a rare sunny afternoon. 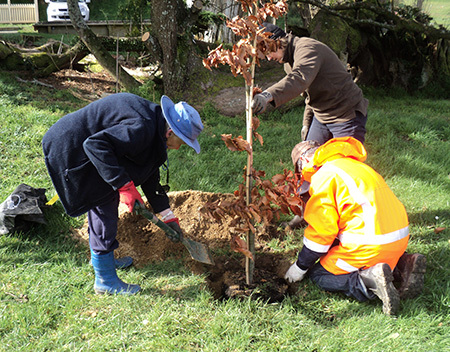 The big event of the day was when our longest living gardener (that's Joan, on the left) planted a copper beech, fagus sylvatica purpurea. In her childhood, Joan lived in Lichfield, Staffordshire in England. During 1938-1948, from the age of five to 15, she went to The Friary School. This school was next to an ancient 'hairpin' shaped path known as the Monks Walk. To get to the walk, Joan said her path way went beside a copper beech tree, which was on a lawn. "It was a huge tree, a beautiful tree." She turned by the copper beech and the Monks Walk was off that path. At Christmas time, the clusters of copper beech catkins were collected from the ground and painted gold or silver for decorations. We hope this copper beech will provide the same joy and memories for future generations, as the Lichfield tree did for Joan in her childhood. Photo: Paul Bicknell. 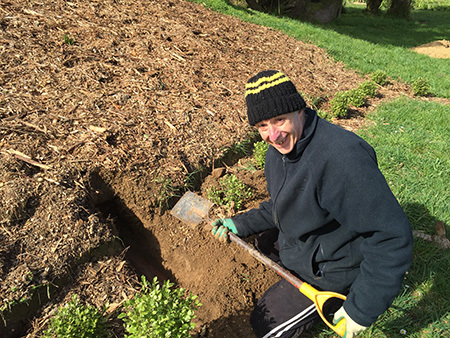 After a sixty minute battle, Paul unearthered a section of clay drainage pipe, intact! 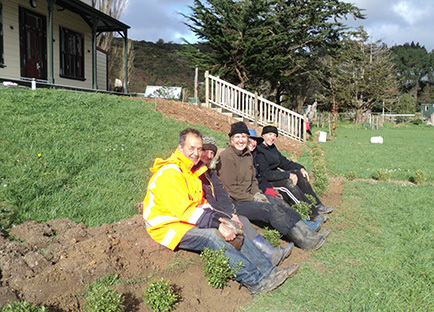 Resting after a great day in the garden extending our hedge. Photo: Lorna Webb. 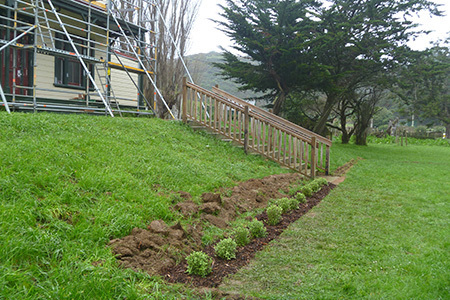 The first line of the formal lawn hedging is planted with pittisporum 'midgit'. 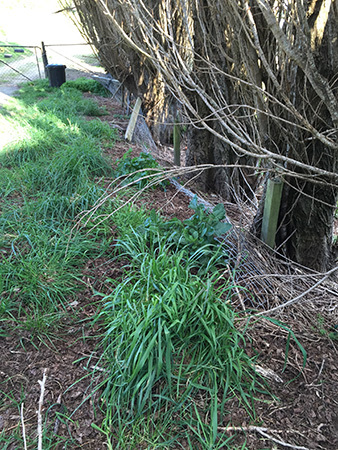 This low growing native plant is an alternative to buxus, which suffers from blight. 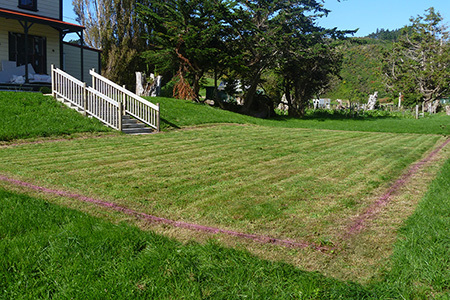 We marked out the boundary of a formal lawn in preparation for planting the hedge around it. 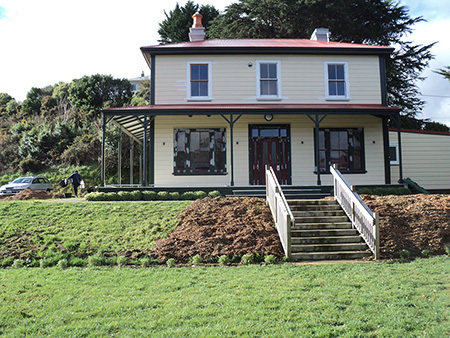 The bank above the lawn will be planted in heritage roses and flowers that would have been available in New Zealand during 1840-1900. The herbel ley looking great beneath the orchard trees.